A dietary supplement (also known as food supplement or nutritional supplement) is a preparation intended to supplement the diet and provide nutrients, such as vitamins, minerals, fiber, fatty acids, or amino acids, that may be missing or may not be consumed in sufficient quantity in a person's diet. Some countries define dietary supplements as foods, while in others they are defined as drugs or natural health products. 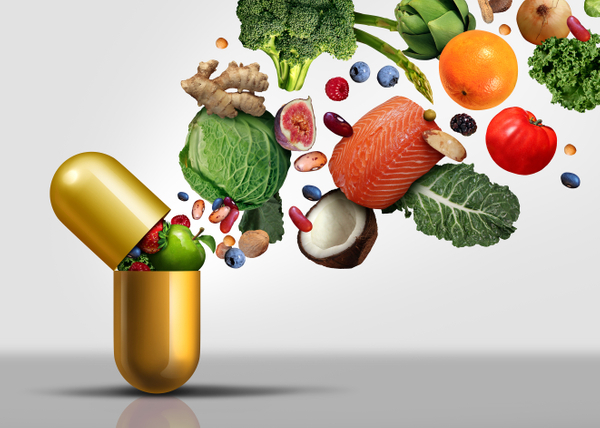 Supplements containing vitamins or dietary minerals are included as a category of food in the Codex Alimentarius, a collection of internationally recognized standards, codes of practice, guidelines and other recommendations relating to foods, food production and food safety. These texts are drawn up by the Codex Alimentarius Commission, an organization that is sponsored by the Food and Agriculture Organization of the United Nations (FAO) and the World Health Organization (WHO).The Food Supplements Directive of 2002 requires that supplements be demonstrated to be safe, both in quantity and quality. By definition, vitamins and minerals are essential, i.e. the body cannot make them, so they must be obtained exogenously or from the diet, but excessive intakes can be harmful, notably Vitamin A. Consequently, only those supplements that have been proven to be safe may be sold without prescription. As a category of food, food supplements cannot be labeled with drug claims in the bloc but can bear health claims and nutrition claims.